UK: Innogy has ordered the go-ahead for the 860MW Triton Knoll offshore wind project in the North Sea after completing the £2 billion (€2.23 billion) financing for the project. In the middle of August, Japanese utilities J-Power (25%) and Kansai Electric Power (16%) acquired stakes in the project from German developer Innogy. It is the first time a Japanese utility has invested in an overseas offshore wind project. Innogy arranged a consortium of 15 lenders to secure £1.75 billion in debt facilities. The lending group includes Sumitomo Mitsui Banking, ABN AMRO, MUFG Bank, KfW IPEX-Bank, ING, National Westminster Bank, Lloyds, BNP Paribas, Landesbank Baden-Württemberg and the London branch of Santander. "By reaching financial close, we have created the financial foundation for realising and operating the Triton Knoll offshore wind farm jointly with our new equity partners and international lenders," said Hans Bünting, COO of renewables at Innogy. The site, supported by a UK subsidy support contract, will be located 32km off England's east coast. It will comprise 90 MHI Vestas V164-9.5MW turbines and is expected online by 2021. Triton Knoll project director, Julian Garnsey, said: "This is a great moment for Triton Knoll and the UK offshore wind industry as we formally secure the means to deliver around £2 billion of new UK energy infrastructure. "Triton Knoll expects to deliver at least 50% of our investment with UK firms over the project's lifecycle and at the height of construction we expect to see over 3,000 people working on the project." Other suppliers include Sif, Smulders, NKT Cables, Boskalis, GeoSea, Seaway Heavy Lifting and Siemens Transmission and Distribution, Innogy said. 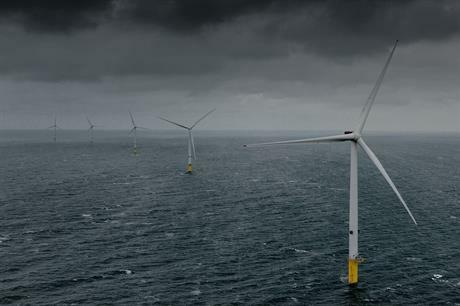 The power from the project will be bought by rival offshore wind developer and utility Ørsted. After the project is completed, Ørsted will "handle the intra-day fluctuations in volume and prices balancing the power into the grid. Ørsted's market exposure is limited to fluctuations in power prices on a day-to-day basis", the Danish firm said. It will receive £74.75/MWh (€83.62/MWh) when it begins producing electricity. Innogy has also agreed a memorandum of understanding to use the Associated British Ports' Grimsby facility, northeast England as the project's operations and maintenance base. MHI Vestas, meanwhile, will use the Seaton Port in Teeside, operated by AbleUK, as its turbine pre-assembly site. AbleUK will build an additional 140-metres of quayside at the port to handle the turbine's large components, Innogy said.